Cancer that occurs in the cells of the breast is called breast cancer. On the list of the most common forms of cancer affecting women in the United States, breast cancer comes second after skin cancer. Although breast cancer occurs in both men and women, it is more common in women. Diagnosis, screening and treatment have been improved by increased support through research funding and breast cancer awareness. This, in turn, has led to a steady decrease in the number of deaths. Breast cancer survivors have also increased, but there are still lots of question around breast cancer that need answers. Normally, breast cancer is painless in the beginning, but it may become painful when it gets past a certain point. Breast cancer is usually hidden within the breast tissue and slowly utilizes your body’s resources to thrive, so you may feel nothing about its development for some time. According to statistics, a small hard clump of cancer cells or a breast tumor does not cause pain in the breast. Pain can only be felt if the tumor reaches about 2 centimeters in diameter or more. But a tumor can also be larger than 2 centimeters and still remain painless. Only 5 to 15% of women newly found to have breast cancer experience breast pain. Only 7% of women with breast cancer sought medical attention because of breast pain. How Does the Pain Feel Like? Benign breast pain occurs on both breasts as opposed to breast pain due to breast cancer which is felt in one breast. The only exception is non-hormonally related breast pain, which is usually felt on one side. Pain caused by breast cancer is known to be specific and incessant – keeps hurting on the same spot. But you can be having breast cancer and not feel any pain at all. 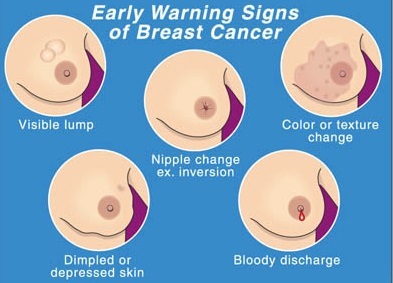 It is, therefore, necessary to be aware of other symptoms of breast cancer. Note: Talk to your doctor if you experience any kind of breast pain. Breast pain decreases the quality of life for many women even if it is not cancer related. A study has shown that about 15% of women have felt pain in their breast at some point in their life that interfered with their daily activities. Other Than Pain, What Symptoms Do Breast Cancer Have? Does breast cancer hurt? Yes, it may hurt. The main question here is what causes this annoying condition. The cause of breast cancer is not clear yet. Breast cancer occurs when some breast cells start growing abnormally. These cells divide faster than normal cells and form a lump and may even spread to other parts of the body. Breast cancer begins in form of invasive ductal carcinoma or invasive lobular carcinoma. The latter begins in the glandular tissue while the former begins in the milk-producing ducts. Breast cancer can also begin in other tissues or cells within the breast. Environmental, hormonal or lifestyle factors have been identified by researchers to increase the risk of getting breast cancer. However, it is still unclear how people with risk factors do not get cancer while those without get it. There is a possibility of breast cancer being caused by a complex interaction between genetics and the environment. Only an estimated 5-10% of breast cancer cases are associated with gene mutations passed down the family line. Inherited mutated genes that can increase the chances of getting breast cancer have been identified. Breast cancer gene 1 (BRCA1) and breast cancer gene 2 (BRCA2) are the most common. They both significantly increase the risk of both ovarian and breast cancer. If breast cancer or other cancers exist in your family history, a blood test is recommended to identify specific mutations in BRCA or other genes being passed on in the family. Request your doctor to refer you to a genetic counselor who can review the health history of your family. The counselor can also explain the risks, limitations and benefits of genetic testing and provide guidance on appropriate genetic testing. Radiation therapy kills cancer cells with high-energy waves. Surgery involves the removal of the whole breast (mastectomy), or the tumor and the surrounding tissues (lumpectomy). Chemotherapy uses drugs to shrink or kill cancer cells to decrease or control cancerous symptoms. These powerful drugs can cause side effects including hair loss, hot flashes, nausea, fatigue and early menopause. Hormone therapy administers drugs to prevent hormones, especially estrogen, from supporting the growth of breast cancer cells. Postmenopausal women are given letrozole (Femara), anastrozole (Arimidex) and exemestane (Aromasin) while tamoxifen (Nolvadex, Soltamox) is for women both before and after menopause. Vaginal dryness and hot flashes are some of the side effects of these drugs. In some cases, this therapy works by stopping hormone production by the ovaries either through medication or surgery. Targeted therapy involves the use of medicines to prompt the body’s immune system to destroy cancer. Medicines such as lapatinib (Tykerb), trastuzumab (Herceptin) and pertuzumab (Perjeta) are used to target breast cancer cells with high levels of a protein known as HER2. Palbociclib combined with letrozole is prescribed to postmenopausal women with certain kinds of advanced cancer. Chemotherapy, targeted therapy or hormone therapy can be combined with radiation or surgery. These therapies will kill any kind of cancer left behind after tumor removal.